There were 2 celebrations in Ryan’s school on the 30th Sept and 2nd Oct inconjunction with Children’s Day and Mid Autumn Festival respectively.Â Further the H1N1Â advisory by MOE, the schoolÂ stepped up their hygiene measures and it has been a long while since parents were allowed to participate in theÂ school’s activities. 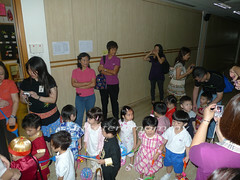 Nonetheless,Â the school made an exemption for Mid Autumn Festival. Parents were invited. 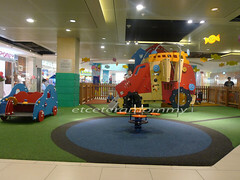 Although invites wereÂ limited to 2 pax per child but it was good enough. This would be Ryan’s last celebration at the school in view of our impending move back to KL end of the month soÂ session as suchÂ (get together for parents and child)Â was a bonus and greatly welcomed. In the meantime, we are still contemplating whether or not to send RyanÂ to the kindy due to some reservations on our end.Â Our first choice wasÂ Tadika Sri Cempaka, unfortunately they only take in students 5 years old (K1 and above). We have not really surveyed around. In any case, Seri Soka is our backup. 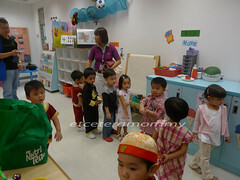 1) Children’s Day. 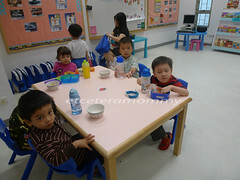 Ms Sng and Liang Laotsi helped me snapped some pics of the kids. 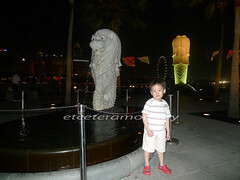 That night I brought Ryan to the Marina Square playground again. 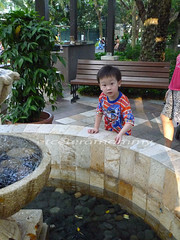 Ryan loves the playground hereÂ as it was not crowded and importantly it’s air conditioned. 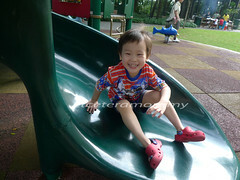 I never liked to bring Ryan to the playground at our place as it’s always populated with older mischievous kids. 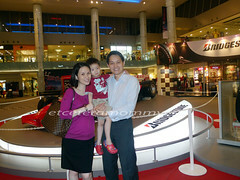 Hubby has been a F1 fan for more than a decade; since Aryton Senna days. For me.. I don’t follow each and every raceÂ as much as I used compared to when I was in my Uni years. Now I only keep abreast with the general F1 news. Hubby bought the tickets many months in advance to enjoy the early bird discount ($248 pp). 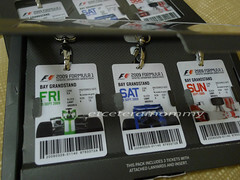 This year we decided to get the grandstand tickets as opposed to the walk about tickets which we opted for last year. It was simply too tiring walking around without a fixed spot to sit. I was telling hubby it was a decision wisely made, otherwise I doubt I would be able to keep up his pace walking around with my current condition. Ryan knew about the impending F1 race weeks ahead the actual day as we passed by the route every morning when we send hubs to work. He would tell us he wants to bring along his camera (our old Canon IXUS 50D is Ryan’s possession now). 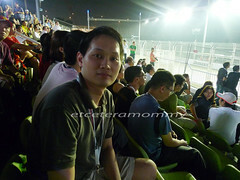 You should see how excited he was just by looking at theÂ prep work (fences, seats, lightings)Â the organiser put up. We wished we could bring Ryan along but kids below 7 years oldÂ were strongly discouraged to attend due to the loud noise. We dare not take the risk. 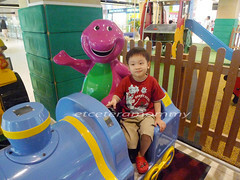 Hopefully we could bring him along to Sepang’s race next year, at least the track is much further from the seats/spectators. Day 2 – 26th Sept. I felt extremely heavy hearted the whole day anticipating Ryan would beÂ very upset when he learned we had left him behind for the race. Just before we leave home, I quickly got him ready for bed -Â sponged him andÂ brushed his teeth. 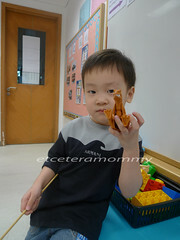 He was in the play room with Loida when hubs and I sneaked out. It has been a while since hubs and I had to sneak out. Ryan had been a darling, waving goodbye to us when we were going out for a long time until recently – a couple weeks back to be exact. I could only assume it’s because of the little person in me. Mmm…. 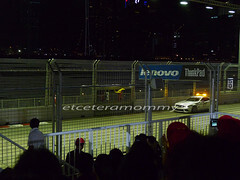 The qualifying race is at 10pm but we sneaked out earlier at about 8.00pm anticipating the bad traffic. 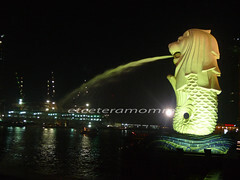 We reached Suntec at around 8.30pm. So we took a quick bite at Cartel’s Cafe @ Marina Square.Â I had their award winning St Louis Pork Ribs and hubs orderedÂ Cartel’s Pan Fried Macaroni.Â Yummy!! The qualifying session lasted about an hour. It ended at 11.15pm. There were people everywhere. So many F1 enthusiasts. I guess the night race is a real big catch and this year there were many supporting races and shows. 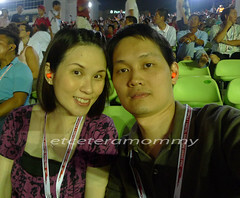 After the qualifying, we walked a distance until we reached the Suntec Convention Centre to hail a cab. We were lucky. There was no queue and we reached home around 11.40pm. Loida told me Ryan refused to sleep. He cried so muchÂ and demanded Harry-Boat-Harry stories (it’sÂ actually 3Â different bed time stories which I would tell Ryan every night. First is about Harry visiting theÂ zoo/animal kingdom, followed by Mickey and Minnie on boat ride and lastly a story of Harry again – can be any storyline)Â but poor Loida had no idea what stories were they. It doesn’t helped Ryan only wanted the 3 stories and no others. Day 3 – 27th Sept. Ryan woke up demanding us to tell him where we went last night. We told him we went for the race. 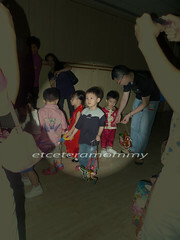 He seemed to understand that he is too young to attend but can’t denied he was still visibly upset. Poor boy. We had to leave before 6.30pm for the 8pmÂ race. I had intentionally allowed Ryan to skip his nap today so he could sleep early. I briefly told Loida about the stories in hope tonight will be a smoother night for both of them. The race ended around 11.00pm. Overall it was a boring race, hahaha at least for me. F1 is really a TV sport. 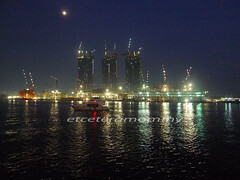 Being on-site is really for the feel and atmosphere. You could only see the car zoomed passed in split mili seconds. The race organisation was really poor too. We were literally shoulder to shoulder on our way out. It doesn’t helped with the very limited exit points. Thumbs down to the organiser! 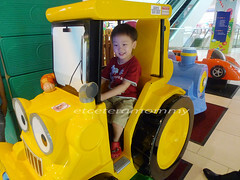 The next day, to make it up for Ryan, I brought him to pick Daddy after work. I went for my 5th month detailed scan on 15 sept 2009 (5 monthsÂ 3 days). I’m grateful that everything went smooth andÂ well. I reached Dr Tony Tan’s office at 3.15pm. My appt was at 3.45pm. With the half an hour to spare I went to their cafe with the intention to grab a quick Roti Tissue. Unfortunately, the fella who manned the stallÂ told me no roti tissue but I can opt for Roti Prata Telur (similar to our Roti Canai). I was so disappointed. Haiz. How could they turn down a pregnant lady’s craving right. Hahaha.. as if they care. After my quickie bite. I went upstairs for my appointment. IÂ wentÂ to the loo withÂ a dip stick forÂ the routine urine test. All normal. Next, the nurse called my name for pressure and weight check. My eyes popped when I saw 53.8kg on the scale. Gosh.. I gained close to 3kg in a month?? I sorta expected a gain but 3kg?Â Scary. Must be the roti. LOL. BB2 was cooperative for awhile but after 20 minutes or so BB2 decided to put up a fuss.Â After numerous futile tries to capture the image on spine and right heart,Â my obgyn suggested a 10 minutes break. 10 minutes passed. BB2 was cooperative again. Voila. All done. All perfect. BB2 was about 377g (about 27g heavier than average) with long legs and arms. I guess that explains why my tummy is bigger this time round comparing to Ryan’s at the same month. My appetite is growing and growing. I don’t have any special cravings but I do have a slight preference overÂ sweet flavoured drinks/food than anything else. 7-11 Slurpee, Ice cream, Starbucks’s Chocolate Chips Vanilla are some of my favourite! Soooo unhealthy! I opted for a Chorionic Villus Sampling procedure back in July. That procedure made me $1500 poorer but it was really money we couldn’t haveÂ saved anyway. After 10 days of agonising, torturing, sleepless nights, I received theÂ much awaitedÂ phone call from the clinic. Thank goodness. All’s good. Yippeeee!!! 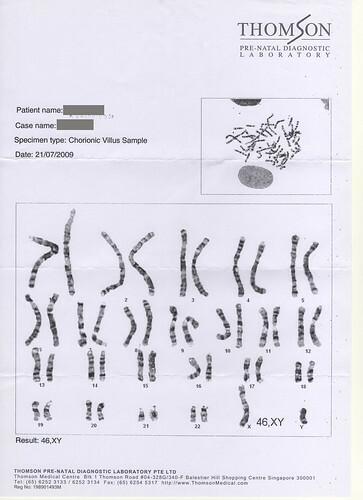 The above is a copy of BB2′s chromosome chart received from my obgyn and that was after I made a personal call to the lab for a copy of it. Apparently it wasn’t a standard procedure to release the chart; summary report yes. Mmm.. anyway.. glad I made that extra effort. So cute. I brokeÂ the news to Ryan 2 daysÂ after I found out I was pregnant with BB2 (19 May 2009). Not being biased. Daddy and son actually found out about the news on the same day. Come to think of it, how did I manage to keep mum for 2 days without spilling the beans. 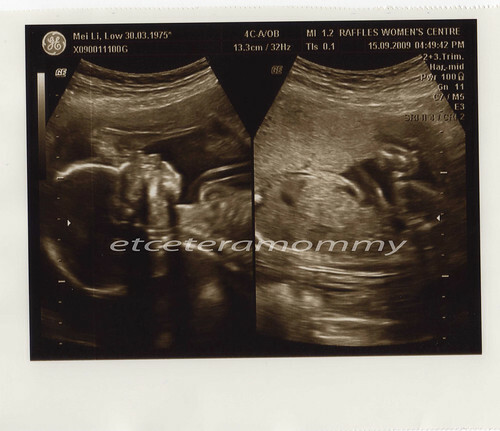 I’m almost 6 months into my pregnanyÂ and I could seeÂ Ryan’s affections towards ‘little brother’Â are fonder by the day.Â I showedÂ Ryan the scan pictures starting from my 3rd month scanÂ Â andÂ I was so content when I see theÂ smile on his face eachÂ time he look at the pictures. Every now and then, he would ask me if I have any new pictures of the baby. So he has seen picture of his little brother from pea size until now almost 6 months geatational size. I explained to Ryan that baby will only come out once he has grown into aÂ healthy size. He seem to take on the explanation quite well. He asked if he went through the same process when he was a baby. I’m glad Ryan is such a matureÂ childÂ who understands why mommy couldn’t carry him now, why he couldn’t rest his legs on mommy’s tummy, why sooner or later we won’t be able to shower together, why mommy’s tummy is growing bigger and bigger, what not. Affections. Ryan has always been an affectionate boy. He’s the type who would not hesitate to show you his limitlessÂ love, name it by words or physical (the innumerable hugs andÂ kisses). OMG, this is the time when I wish I could put a pause to time. I am already missing him. He’s growing up too too fast. That said, there is no surprise he too made no reservation showering his affections to little brother. He would ask me to lift my shirt so he could touch and kiss my tummy, speak to little brother (saying hi and byes), put his hand on my tummy to feel little brother’s kicks… something I would expect from Daddy really. Jealousy. Yes and No. Ryan did not show any negative reations towards the impending arrival of a new family member. 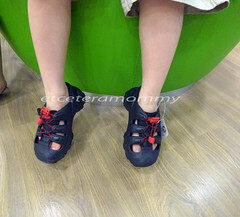 I guessÂ to him, having another baby at home simply mean having another playmate/ toy to play with.Â Clinginess yes!!! ToÂ the certain extent he would just walk behind me around the house; like my mini shadow.Â I used to be able to kiss him goodbye and leave the house to run some errands. Now, back to sneaking out days. On good days, he would be contented to stay home with my helper. On bad days, he would call me on my mobile several times asking me where I was, what time I would be home, etc (yea.. we have our numbers stick on the wall, so he could call us anytime he wants). Once we asked Ryan if he’s willing to share hisÂ books, toys etcÂ with little brother. “Would you share your toys with little brother?” I asked. “Must keep for little brother?” he asked…. 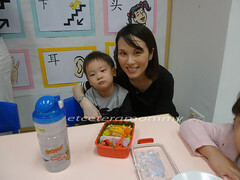 I still remember his first step of independence when he was 11 months. 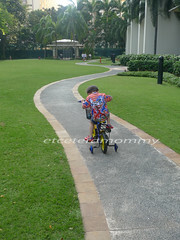 Now he’s cycling… how time flies, really! 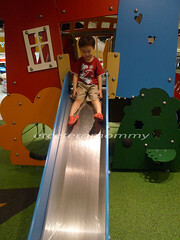 He love the slides but it was always difficult for him to take the first few steps because he would scream saying it was too high. I am not surprised he has agrophobia (height) like YehYeh.